When it comes to the fan service game, Harry Styles is hard to beat. Everybody knows that the Brit heartthrob is one ridiculously attractive man, but what makes him such a steal is his unwavering love for his dedicated fans. While it’s normal for celebrities to show appreciation to their supporters, our beloved Hazza always makes sure to go above and beyond in his fan interactions – from calming a fan down after she had a panic attack, to standing up for his legion of devotees in front of a nosy reporter. As we countdown to his upcoming show in Singapore, we rounded up 5 of his most heart-fluttering moments to date. Watch our compilation video below and try not to fall in love! How lucky are these fangirls? But fret not, your dream of meeting Harry Styles is soon about to come true! Come 3 May 2018, he will be coming back to Singapore to perform for a full-fledged concert – and if these moments didn’t manage to convince you to go watch him live, we don’t know what else will. Limited tickets are still available at www.sportshubtix.sg. 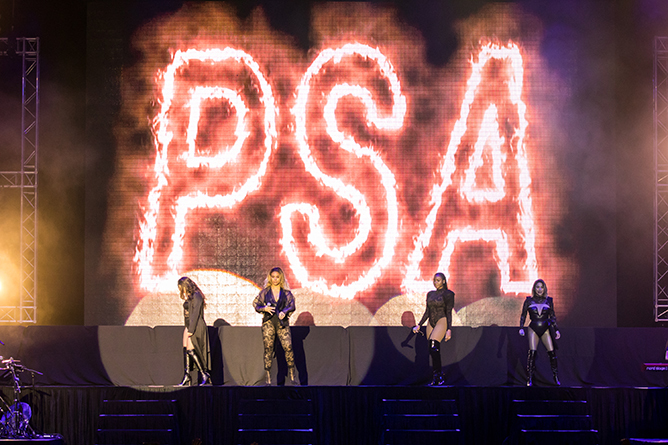 It’s been barely a year since Fifth Harmony last performed in Singapore, but on their return for the long-awaited PSA Tour, the ladies are showing that it’s still worth it. Swiftly kicking off their mid-week gig with a simple ‘PSA’ flashing on a backdrop screen, Lauren, Normani, Ally and Dinah Jane strided onto stage just past 8pm to thunderous applause that could fill a theatre. Impressive, considering that those cheers came from a relatively smaller crowd at the [email protected] event space. While the turnout might be a stark difference from the girls’ first showing at The Star Theatre last year, it didn’t stop the quartet from shimmying, sashaying and strutting about the minimal stage. Launching into their breakout smash ‘Worth It’, the fierce foursome whipped everyone in attendance into full focus, as they captivated all eyes by nailing every choreographed dance move to a T. From then, they tore through familiar hits like ‘BO$$’ and ‘Reflection’ from their first album. But the forefront of the night’s setlist belonged to their latest self-titled album, which was released last year following Camila’s departure. They performed every song off the record – from the sassy ‘Deliver’ to the uplifting ‘Make You Mad’ – and pleasantly elevated the tracks to new levels with their flawless vocal deliveries. On ‘Lonely Night’, a chair was brought onstage for a mystery guest… which turned out to be a lucky male member of the audience! 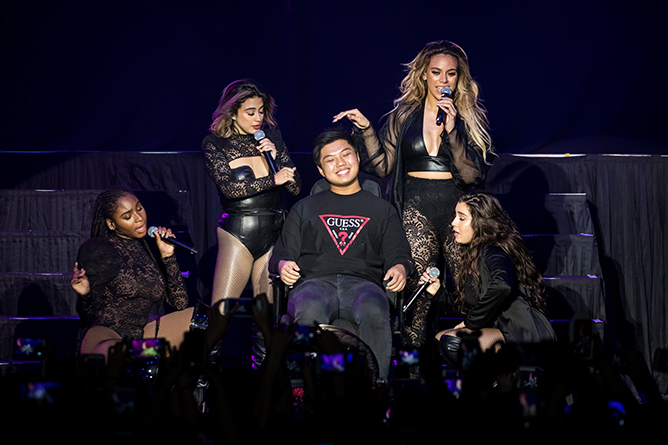 Fans were left envious as the starstruck Harmonizer was flirtatiously led across the stage by the girls, before ending the performance with individual hugs. It was a nice, spontaneous moment that allowed 5H’s personalities to shine through, fitted nicely in the middle of an otherwise regular show. While all four ladies were looking their flawless selves for the sea of phone cameras that were recording their every move, they also let their music do most of the talking instead. There were no inspiring speeches given here, just empowering hit after hit with songs like ‘Down’ and ‘Don’t Say You Love Me’, the latter of which only served as a prelude to their massive finale of ‘Work From Home’. But the positive vibes didn’t stop there. As soon as they bowed out of stage for what seemed to be the end of the night, the screen lit up with a video montage as their live band began playing the opening instrumental to ‘Bridges’. 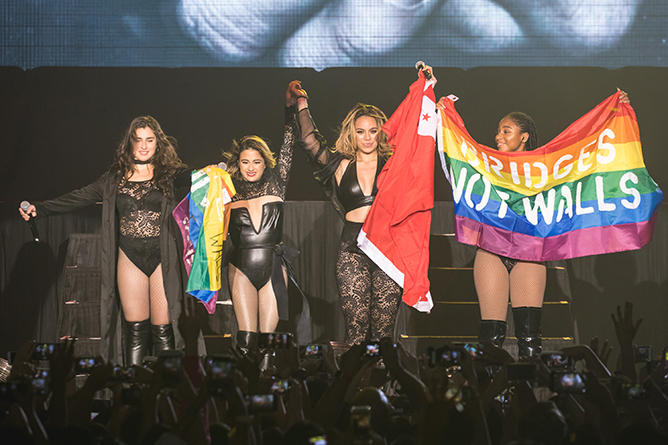 The empowering track welcomed them back for one more sing-along together, as they held up a rainbow flag – symbolising the freedom to love – painted with the lyrics ‘Bridges Not Walls’ and waved it to the adoring love of their fans. 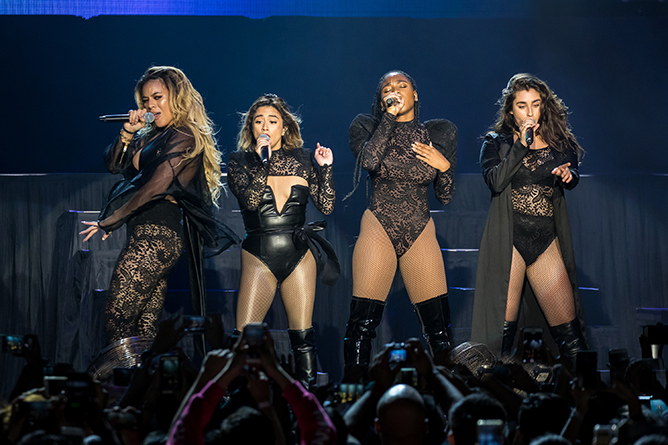 It was a testament to the brand Fifth Harmony has built over their six years together, as one would observe their fans of different ages, races and backgrounds trickle out of the concert hall together, still humming the hits. With Fifth Harmony’s recent announcement of their indefinite hiatus, we can’t help but to be thankful that we were at least treated to one final farewell before they each take on their solo careers full steam ahead. And while the end of an era marks an uncertain yet exciting future, the unforgettable memories and music built between 5H and Hamonizers will surely, last a lifetime. Remember when the Our Times craze practically swept the nation and all of Asia back in 2015? If you’re one of those who can’t get enough of the romance between Lin Chen Hsin and Hsu Tai Yu in the Taiwanese coming-of-age flick, here’s some good news: the Chinese media has recently confirmed that a sequel will be in the works! 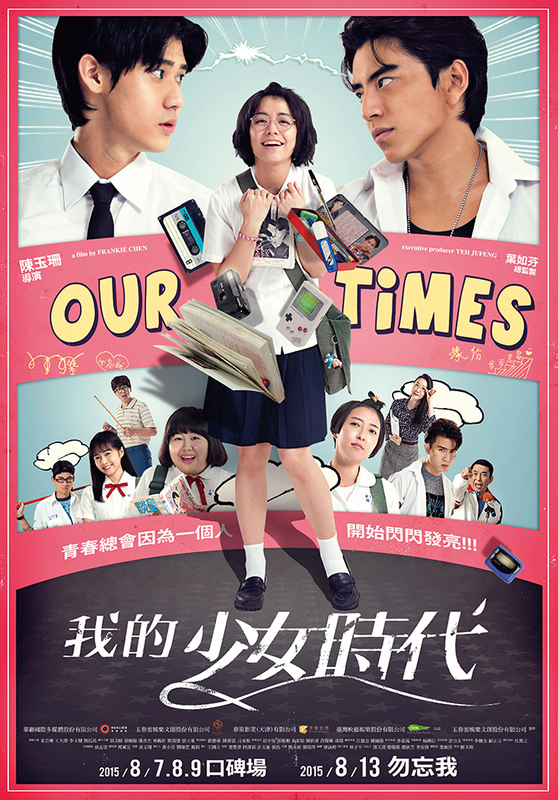 A nostalgic love story between a nerdy high school lass and the school’s resident troublemaker, Our Times (我的少女时代) went on to become a major box office hit, catapulting Taiwanese rising stars Vivian Sung and Darren Wang to instant fame. The film ended on a fairytale-esque note with the estranged lovers reuniting almost two decades later at an Andy Lau concert, but is it happy ever after for our favourite couple? Looks like we’ll find out soon enough. It will not be called Our Times 2. Due to copyright issues, it’s been reported that the highly-anticipated sequel will not be named Our Times 2 (我的少女时代2) – but instead taking on a totally different title. Which understandably caused many to be concerned about the series losing its original essence, considering how it’s already such a recognisable piece from the name alone. But we think fans have nothing much to worry about, as director Frankie Chen and screenwriter Tseng Yu Ting will once again be helming the production. Will Vivian Sung and Darren Wang be in it? Initial reports stated that Darren Wang will be making a comeback as Hsu Tai Yu, but we might have to burst your bubble right here: the Taiwanese actor has stepped out to clarify that although he has plans to work with Frankie Chen in the future, he will not be taking part in the upcoming production. And neither will Vivian Sung, who’s currently busy with other filming commitments. What a blow for fans of the onscreen lovebirds, but guess that’s something else to look forward to as well. Besides, rumour has it that the female protagonist is quite the A-lister so we’re excited to see whether the new cast will be able to match up to the chemistry of our OG OTP. 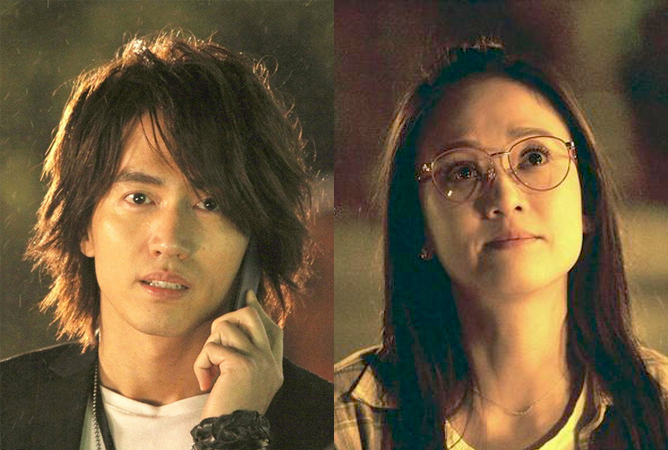 Even better, just imagine how epic it’d be if Joe Chen and Jerry Yan, who acted as the grown-up counterparts of Lin Chen Hsin and Hsu Tai Yu, reprised their roles? You never know! The series is reportedly still in the casting stage, with director Frankie Chen aiming to begin filming this summer. Based on the previous timeline, Our Times started filming in October 2014 and wrapped up in April 2015, before hitting the big screens two months later in June. There’s no definite release date for the sequel yet, but chances are it’s likely to make its debut sometime next year. Keep your eyes peeled! Are you excited for the sequel? Meanwhile, hit us up with your dream casting suggestions in the comments below! For longtime fans of Nathan Hartono, you might remember his days as a fresh-faced jazz crooner with crinkly eyes and a beaming smile. Now, he’s made it huge even beyond the local music scene, having made his official debut in China with his first ever Mandarin release ‘Electric Love (爱超给电)’. Yet despite his ongoing successes, the 26-year-old is still the same humble boy at heart. Catching up with the lad about his electrifying new single, he shared with us about his new musical direction, upgraded Chinese skills and penchant for cosplaying as… err, Spider-Man? Read on! Hi Nathan! It’s been almost a year since we last had you on our January cover. How has 2018 been for you so far? We’re just kicking it off and it’s been great so far. I’ve spent most of the past year in China and working on my Mandarin release. A lot of the year remains to be seen because I know I’ll be spending a lot of time in Beijing, so I’m both excited and a little bit scared for that. Your Chinese has certainly improved a lot! How would you rate your skills from a scale of 1 to 10? Before, it was like… 2. Now, I’m like a 5? I’m getting better, but I wouldn’t be so brave to give myself an 8 or 9. I want to reach a level where I can actually write songs in Chinese, and it’s gonna take awhile (laughs). For the music video of ‘爱超给电’, you’ve mentioned that it’s “a love letter to all shapes, sizes and colours of love”. What was the inspiration behind it? For the song itself, it’s really about love that can strike you in many ways, so we kind of took the concept over to portray the diversity of love. The ensemble in the music video – the dancers, cosplayers and drag queens – are all people who are comfortable in their own skin and true to their idea of beauty. Sometimes it’s conventional and sometimes it’s completely unconventional, but it’s just so much fun to see and experience. You’ve had lots of Japanese-inspired characters from dolls to pigs in the music video. If you could cosplay as any character in the world, who would you pick? I wouldn’t play the pig, just saying. Hats off to her man, she was in that inflatable suit for most of the day and she was sweating buckets. It was horrible! But back to the topic, I’d like to cosplay as Spider-Man – swinging from place to place across the traffic and all, that’s the one thing I’ve always fantasised about even till now. I remember there was a period in my life where I was obsessively looking for a Spidey costume for Halloween… still never fulfilled that wish though (laughs). While we’re at it, what are your thoughts about Japanese culture? I’ve been to Japan a couple of times, but one thing that’s always reaffirmed for me is that it has a very obsessive culture – in a good way. They are very good at completely giving their all into one task and making sure it can be done to its best extent. It’s such a fundamentally different place from the rest of the world, so much so that it seems like they’re very much ahead of everyone else. But I love it because when it came to working on this music video with the Japanese crew, everyone was extremely detail-oriented and gave themselves fully to the project which was very inspirational to see. Let’s talk about your upcoming album. How’s the record going to sound like now that you’re going towards a fresh musical direction? Musically, I’m in a strange place right now. So far, it’s sounding very different from the things I’ve done before so to even define the genre itself is difficult. I would say pop for the most part, but there are also bits of R&B and some jazz elements here and there. Lastly, what are the top three things on your musical bucket list? Firstly, I need to release the EP but that’s going to be done so I guess that’s cheating (laughs). Being able to write more, which has always been a resolution I fail at. And lastly, [it’s] just really getting into the flow of producing a lot more, be it my own music or other people’s stuff. Thanks to Warner Music Singapore for the interview opportunity! Nathan Hartono’s debut Mandarin single ‘Electric Love (爱超给电)’ is out now. The month of March brings us a whole slew of Netflix series to get us into couch potato mode. With the March holidays in full swing, we’re here to give you the scoop of must-watch titles you should definitely binge on! What is it about? Filled with the perfect mix of satire and wit, this series follows the similarly-titled acclaimed indie film and is set in a “post-racial” society, where students of colour try to overcome social barriers and prejudiced judgements in a predominantly white Ivy League school. Why a must-watch: This series brings our attention to significant societal issues such as racial bias and social injustice. Besides raising awareness about these important topics, it also features a strong, empowering black identity which is arguably necessary on national television these days. Despite its complex plot, the events are peppered with lighthearted jokes and will unfold with intriguing plot twists you’ll never see coming. What is it about? Set in the Marvel Cinematic Universe, Jessica Jones is a fictitious superhero armed with a myriad of extraordinary superpowers, snark and a teensy bit of sweet. Running a detective agency in the day, join our titular heroine on her double-life adventures as she simultaneously tries to get through each day and save the people around her. Why a must-watch: Though fictional, this show explores important, hard-hitting issues such as PTSD and assault in a realistic and honest manner through the complex yet endearing characters. Watch on as the various characters come to terms and try to resolve their problems with courage in season two. What is it about? The Crown is a biological timeline of events, chronicling the reign of Queen Elizabeth II. Featuring the endless political rivalries and challenges between countries, witness how the newly crowned head of the monarchy has undoubtedly shaped the entire second half of our second century for good. Why a must-watch: A politically charged yet heartbreaking tale of royal romance, this British series is perfect for history buffs and any anglophiles. What is it about? A contemporary prequel to the well-known 1998 horror film Psycho, Bates Motel is certainly not for the faint-hearted. Although the events are rather twisted and borderline gory, it unravels in such a thrilling and shrewd way that you’ll be gripping onto the edge of your seat in anticipation for what’s next. Why a must-watch: Unlike the movie, the latest season incorporates more elements of Norman Bates’ childhood and psychological state, truly fleshing out his descent into madness which makes us empathise with him as a character. We like that it also elucidates his close-knit yet emotionally complex relationship with Norma Bates. What is it about? If you’re a fan of science fiction, fantasy and horror, have a whirl at this adrenaline-pumping thriller flick. Watch as an all-female entourage explore unchartered territories full of danger, threats and impending doom in a whole new fantastical universe. Why a must-watch: Not only does this film feature a stellar cast with fan favourites like Natalie Portman and Oscar Issac, it also plays with realistic sci-fi effects and stimulating visuals that will leave you craving for more. What is it about? A remake of the popular 1947 family film, this heartwarming adaptation follows the journey of everyone’s favourite canine star Benji. After being adopted by a kind family, the once-orphaned mutt strikes up a friendship with the two kids and comes to their rescue when danger befalls them. Why a must-watch: The touching film will not only tug at your heartstrings, but will serve as a timely reminder to give some love and TLC to your family pet as well! What is it about? Based on the best-selling gothic tale by Lemony Snicket, the comedy-drama series follows three orphans who are investigating their parents’ mysterious death. In a cruel twist of fate, the siblings end up with an evil guardian named Count Olaf who relentlessly pursues the siblings’ inheritance. Will the Baudelaires trio succeed in foiling Olaf’s devious schemes and plots? Why a must-watch: With a perfect blend of cynicism, humour and entertainment, many reviews and critics have claimed that the Netflix series has not only matched up to the novels’ standards, but surpassed them. Only time will tell if the renewed season will turn out to be a hit or miss, but we sure have high hopes for this one! What is it about? Compared to bigger genres like pop, the hip-hop culture is rather understated – which is why this film aims to highlight the impact hip-hop has made on our global and music scene. From up-and-coming artistes to moguls of the hip-hop world, Rapture showcases an impressive cast of big-name acts as Rapsody, Logic, G-Eazy, 2 Chainz and Just Blaze as they share their experiences thriving in the industry. Why a must-watch: With the lack of mainstream platforms to explore the extensive hip-hop culture, this original documentary is here to fill the void. Made with the music lover in mind, you’ll be able to live the lives of your favourite rappers and really connect with them on a much personal level. Which Netflix series are you currently watching right now? Share with us in the comments below!